A couple of years ago I switched out the stock 26 x 2.0″ nubby tires on my 2006 Specialized Rockhopper mountain bike for a set of Kenda Kwest 26 x 1.5″ commuter tires. My intentions were to have something that rolled easier around town. With no nubs on the tires to provide resistance it should make for higher speeds with less effort. I do not do that much trail riding in the Metro Detroit area but at the same time it might as well be. This is not a bike friendly area. Something felt a bit off with the skinnier tires. The bike started to squeak. It rode poorly. Most of the time it felt like I was riding on the pavement. Even with the smaller tubes I bought, it made getting the 26 x 1.5″ Kenda’s on and off the wheel a task of its own. It no longer felt like a mountain bike. My Rockhopper was telling me it wanted to be a mountain bike again. I wanted it to be one too. I still had a set of 26 x 2.0″ nubby tires that I could put back on. That is not what I wanted. What I wanted was a 26 x 2.0″ commuter tire for a mountain bike. The minimal roll resistance of the Kenda’s I had on but with a bit more sidewall to provide a better ride. After doing some searching the Serfas Drifter City’s popped up. You could say all commuter bike tires have an inverted tread pattern but look at how deep those are. The Drifters were exactly what I was looking for. REI had them in stock so I bought them locally instead of waiting for them to be shipped from Amazon. They cost the same at both places. The only knock I could find about the Serfas Drifters was they make a suction sound when rolling. This was not a concern for me when purchasing. Getting the old tires off was the hardest part of putting the Serfas Drifters on. Do I ever hate those smaller tires. Thankfully my old inner tubes that have been sitting in storage for two years still worked. Thirty minutes later the new tires were on. Before and after. Much better with the Serfas Drifter City’s on. My Specialized Rockhopper looks like a mountain bike again. A commuter mountain bike if you will. No Suction Sounds – Maybe on a perfectly paved surface on a hot summer day you’d get that. I have been riding around in unseasonably warm but still cold weather (40 degrees in February) on the gentle streets of Huntington Woods, Michigan. The Serfas Drifters Roll – Going with the “wow – I’m going faster test” I can say there is very little resistance at all. These tires roll so much better than the 26 x 1.5″ Kendas did for sure. The middle of the tire has a built-in harder center tread which improves the rolling. 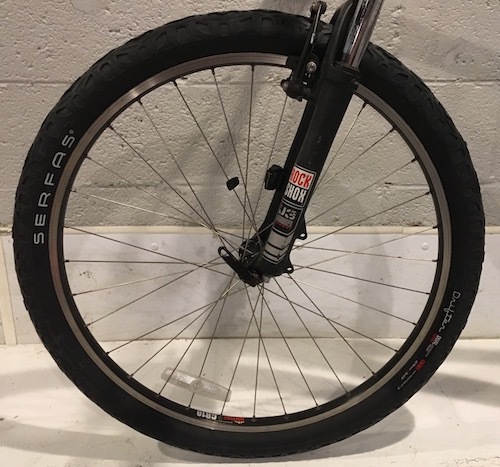 The Serfas Drifters Grip – The center of the tire is harder for improved rolling with softer sides for cornering. Lean into any turn and you can feel the bike shift from rolling to gripping. It was odd the first time making a turn. No More Squeaks – The rattles have gone away. Rides Better – No longer feels like I’m riding on pavement. Way more comfortable. It feels like a mountain bike again with the Serfas Drifter City’s on. I do not miss the smaller 1.5″ tires at all. This bike needs 2.0″ tires. In July 2018 we took our bikes on a trip to the Upper Peninsula here in Michigan. We stayed near Munising and did a kayak trip to the Pictured Rocks. 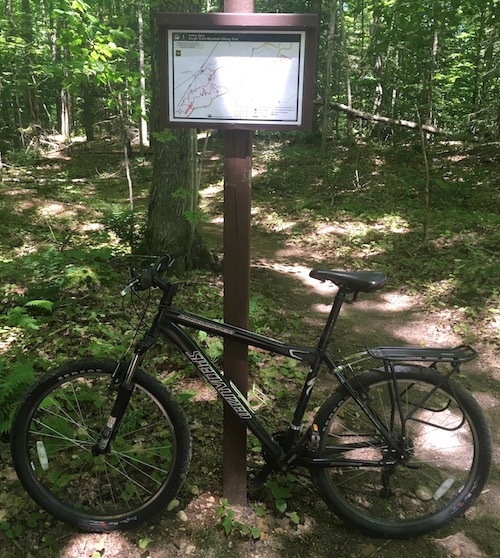 On one day we took our bikes to the Valley Spur mountain bike trail. Before leaving I was debating about switching out the Serfas Drifter tires for my stock tires. Decided that was too much work and went with it. Outside of a couple of slips going uphill the Serfas Drifters did just fine. Commuter Tires on a single track? Yup! Putting these on my Specialized Rockhopper was a smart choice. It gets me wanting to ride the bike again. Pulling my kids in the bike trailer will be a little easier to do too. If anything, the Serfas Drifter City tires have me wanting to ride my old mountain bike for short trips from the house over my Rad Wagon.